The popular statue of a young girl who became famous for staring down Wall Street's bull has moved to a new home outside the New York Stock Exchange. 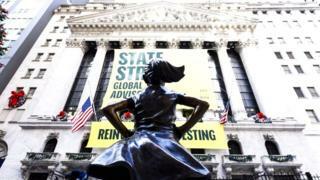 Fearless Girl appeared in the city's financial district on International Women's Day in March last year. The 4ft (1.20m) bronze statue was originally commissioned to draw attention to the lack of women on the boards of financial institutions. It was meant to be temporary but stayed because of its popularity. Officials announced the new location for the statue - an area where the traffic of cars is restricted - in April as its popularity at the old spot raised safety concerns. When State Street Global Advisors (SSGA) commissioned artist Kristen Visbal to create the work in 2017, it said the girl represented the future. Ironically, SSGA itself became embroiled in its own gender pay row later that year. "She says in one image all that advocates can say in pages and pages of arguments and statistics," said Democrat congresswoman Carolyn Maloney who attended Monday's unveiling ceremony. "We see [in her] our daughters, mothers, nieces," added Betty Liu, Vice-President of the New York Stock Exchange, which in May named its first female president, Stacey Cunningham. "She represents potential, progress and hope, but also all the women who have fought for equality before us."